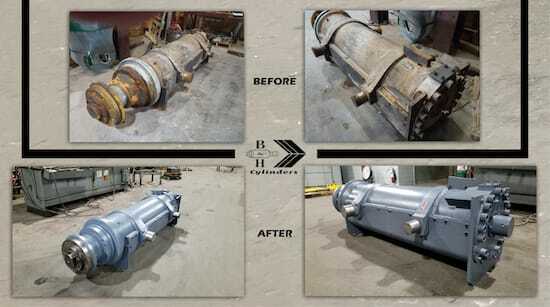 We know when hydraulic cylinder and pneumatic cylinder repair makes sense. Your hard-working hydraulic and pneumatic cylinders perform in the most demanding situations and conditions—including temperature extremes, high rates of speed and continuous operation. Eventually, most will need repair, refurbishment or replacement. When your cylinders are not performing to peak capacity, costly downtime can disrupt your business. Before determining the best option for your underperforming cylinders, let us help you weigh the alternatives. In addition to our design and build capabilities, B&H Machine, Inc. also offers extensive cylinder refurbishment and repair services for our products as well as cylinders from any manufacturer. Our engineering expertise allows us to make the design modifications and repairs that will extend the service life of your cylinder. And our collaborative approach ensures we return your cylinder back to peak performance. B&H engineers work with you to gauge the present condition of your cylinder and forecast future demand on the part. We then compare the costs of new versus repair, the availability of new parts versus replacement parts and the expenses of associated downtime. Our expertise and on-hand technology ensure the latest improvements are included in your repair specifications. Through this process, we're able to determine cylinder deficiencies and improve its design for extended service life. B&H also repairs and manufactures new and replacement cylinders to original equipment manufacturer (OEM) specifications. We repair large bore aluminum extrusion, injection molding and press cylinders as well. But these are just a few of the types of cylinders that B&H is capable of repairing. Quality and precision are the hallmarks of our business and our repair and rebuild services. Our 70,000-square-foot facility contains machining and repair equipment. And our trained technicians and operators understand the demands you face and work seamlessly to refurbish the cylinders you need to keep your line running. If you have questions or concerns about the performance of your cylinders, don't hesitate to contact us.